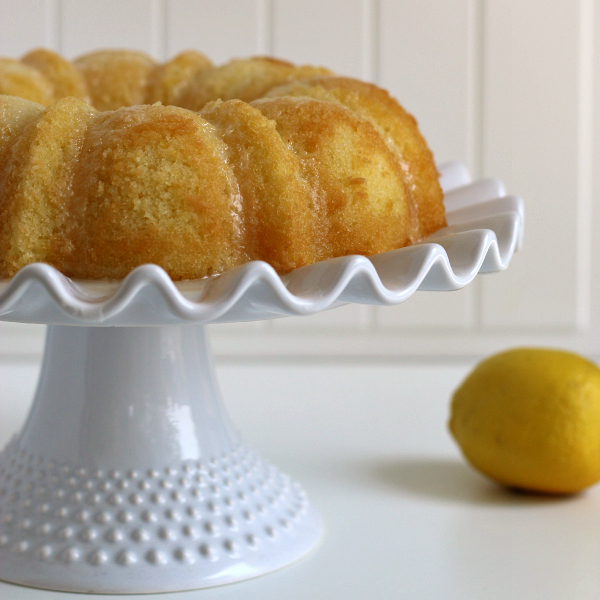 Today I bring you a delicious lemon coconut bundt cake that is not only gluten-free, but dairy-free, tree-nut free and peanut-free also! You won’t miss any of that though, as this cake is full of lemon and coconut flavor, has the perfect cake crumb, and a sweet and tangy lemon icing you’ll want to lick off your plate! You all know that I love baking for myself and my family, but I love baking for other people even more! Seeing the smiles on the faces of friends with food allergies or intolerances when they have one of my desserts is so rewarding! I made this cake for our church potluck recently. In our small church family of about 200 people, there are several other celiacs, several with gluten intolerances, and quite a few with allergies to dairy, nuts and/or peanuts. I wanted to make something that they could all enjoy at the evening dessert potluck. Since I needed to use a nut-free flour blend, I grabbed one of my favorite all-purpose gluten-free flour blends, gfJules. It has xanthan gum in it already, so the xanthan gum listed in the recipe is just for if you use a flour blend that doesn’t have xanthan or guar gum in it already. Results with all-purpose flour blends vary, but you should have good results with any good quality flour blend that is very fine and doesn’t contain bean flours. I can guarantee it’ll be great if you use gfJules though since that’s what I used! If you’ve never tried gfJules, you can order a sample bag of gfJules gluten-free flour here for only $5 and you’ll get $10 credit on your next order! For the liquid in this recipe, I opted for canned light coconut milk from Trader Joe’s. You could use any coconut milk, regular milk or nut milks in this recipe as well, if you aren’t dealing with those allergies. I used coconut oil to keep it dairy-free and to up the coconut flavor. You could also use organic vegetable shortening with good results, but would lose more of that coconut flavor. If you really love coconut, you might want to sprinkle shredded coconut on top of the cake to finish it off too! Since it was a potluck and I didn’t want any risk of cross-contamination during serving, I brought the cake already pre-sliced and ready to serve from this two-tiered serving plate. Each person could just grab their slice and enjoy! One family is all gluten-free and dairy-free, and since they enjoyed the cake, I sent the few remaining slices home with them. Thankfully, I’d kept another piece at home for me too! Hope you can make this soon! I think you’ll love it! This is a delicious choice to slice and bring to a party or potluck! Preheat oven to 350°. Grease a bundt pan very well, then set aside. In a small bowl, whisk together gluten-free flour, xanthan or guar gum (if needed), baking powder, and salt. Set aside. In the bowl of your stand mixer, fitted with the paddle attachment, beat the eggs on medium for one minute. With mixer on low speed, slowly add sugar to the eggs. Increase speed to medium-high and beat until light and fluffy. Stir in vanilla, lemon juice, and lemon zest. Slowly pour in dry ingredients on low speed and mix just until combined. In a small saucepan, over medium heat, warm the coconut milk and coconut oil while whisking, until the oil is melted and mixture is well mixed. Pour the coconut milk/oil mixture into the batter in the mixing bowl. Mix on low speed until you have a smooth, thin batter. Pour batter into the greased bundt pan and bake at 350° for 30-35 minutes. If you do the toothpick test to check for doneness, the toothpick inserted into the center should come out with only moist crumbs, not wet batter. Remove cake from oven and allow to cool in pan, over wire rack for 5 minutes. Use a long skinny spatula or butter knife to gently help release the sides of the cake so it doesn't stick to the pan. Flip cake pan over, removing cake from pan onto wire rack. Allow cake to cool until room temperature or slightly warm. While cake is cooling, prepare lemon glaze. In a small bowl, whisk together powdered sugar and fresh lemon juice until it reaches your desired thickness for glazing the cake. I made mine pretty thin and it soaked more into the cake, which I liked. If you want it to mostly stay on the top of the cake, you'll want to make it thicker so it won't run down the sides of the cake and onto the pan. Lemon coconut sounds like a lovely flavor combo! Zesty, but sweet! Excuse me while I drool all over my keyboard! Why, oh why don’t we live closer!?? You know what I would do if someone brought this to one of our church functions!? Don’t know if it would be a cartwheel or some sort of embarrassingly goofy happy dance! There are only two other families at our church who are gluten free, so I bring GF and DF dishes I can eat (and everyone eats and enjoys too), but no one else really brings anything I can enjoy. I’d be helping myself to more than a few pieces of this beauty, I can tell you that for sure! Thanks for another great recipe, Michelle! ooh this looks perfect Michelle! And I love that it’s also dairy free. We are eliminating dairy from Kelsey’s diet right now and her doctor wants to rule out lactose intolerance first so this would be a great dessert to start with! Michelle, your cake looks perfect, very nice and moist! I really like the taste of coconut in baking, a good thing because I’m dairy free too and I prefer using coconut milk to other milks. You’re very kind to bring it for your church family, I know they appreciate it! My husband is a pastor in a larger church and one of the other pastors wives is also gluten free, there are also several other people who have Celiac or are gluten free for other reasons. I’ve been blessed by the folks at church looking out for me, they are very accommodating of my diet. Made this weekend! Everyone loved it. It came out much more dense than I expected. More like a heavy pound cake. Not sure if I over mixed adding the flour or not. I will try blending the flour by hand next time and see if it makes a difference. Everyone wants it again and it was delicious. Sorry! Five stars for sure! In the oven now. Not sure about it though. The batter was not good. Barely sweet with a lack of lemon flavor. This sounds so yum and such a refreshing cake. Can I bake this in a 8″ (20cm) round pan or do all gluten free cakes work better as a bundt cake? I made the Lemon Coconut cake on the weekend. It’s so delicious. Will make another next weekend. I tried this recipe on 3/27/16 for Easter. I used Pamela’s GF baking mix which has xanthan already added. The cake turned out absolutely horrible. I followed the directions exactly. The cake cooked on the edges and was raw in the middle. Something went wrong with YOUR directions most likely with the beating the eggs until “light and fluffy”. The batter tasted delicious, but was a total waste of my time. Good luck if you want to try this. This happened to me too! I’m so disappointed! I wish I would have read your comments before I made this cake. 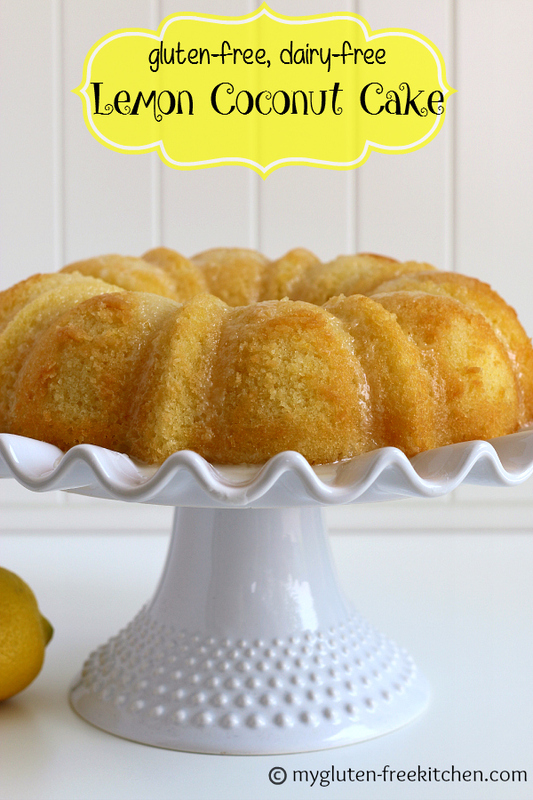 I made this Lemon Bundt Cake for our Easter Dinner this past weekend and it was DELICIOUS! The cake was moist, perfectly sweet, and had the perfect balance of lemon. The icing is where the lemon really packs a punch. WOW! I loved opening my cake carrier because the sweet citrus wafted up to my nose. The bundt cake got rave reviews from all my gluten/dairy eating family! I just wanted to say that I stumbled upon your blog on Pinterest and I tried this recipe and absolutely loved it! I have a younger sister who has trouble with both gluten and dairy and the transition hasn’t been easy for my family. But I made this cake and everyone loved it! You definitely could not tell it was GF and DF. I will be checking out more of your recipes! Keep doing what your doing! Jusy an FYI, I used my pampered chef stonrware fluted pan and had to add 10 min to my baking time and so I added 10 min to my cooling time since the stone stays so hot…worked like a charm!!! Love this recipe…I am a total lemonaholic and this is great to serve when my daughter, who is gf, and her family is over. A win win!!! I made this with about 1/5 coconut flour and 1/4 almond flour. I added a bit of lemon extract and about an extra half or three-quarter teaspoon of lemon juice. I also went light on the coconut oil by 1 to 2 tablespoons. I only included one and a half cups of sugar. I greased AND floured the pan. It probably needed a full 15 extra minutes of bake time. It was delicious! It popped right out of the pan texture was perfect, it was moist and had great lemon flavor. We served it with some sliced strawberries and people were going crazy– those who eat gluten and those who don’t. I think the recipe is perfect as is, we had no trouble at all with it. We are dairy free, not gluten free…can I use this recipe and use regular all-purpose flour instead of the gluten free flour and xantham? Nikki, While I haven’t made it that way, I would think it should work fine. You’d just have to give it a try to see! Awesome GF/DF Cake. Made it in two 9 inch round pans and came out amazing. I would 1.5 X the recipe next time for that amount as I was a little short on batter. I baked at 350 for 30 min. and it is PERFECT. 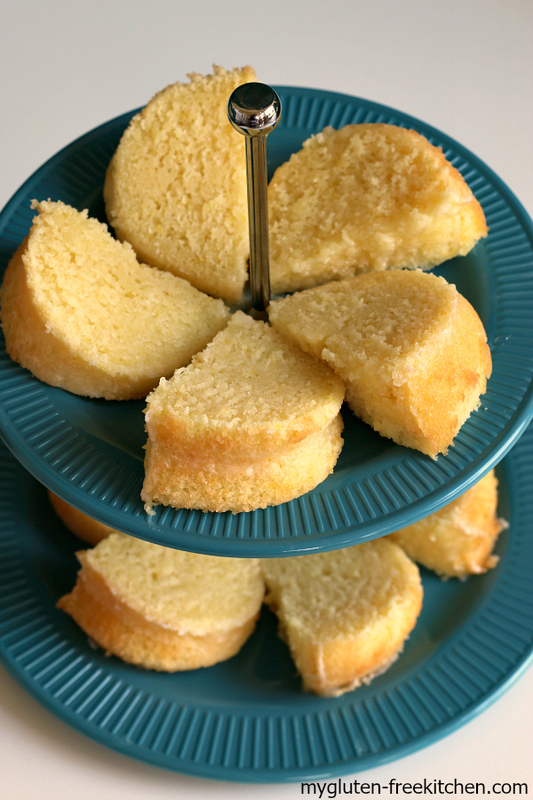 Moist and light texture with perfect Lemon taste (Glaze is where it packs its tangy punch). Would give even to my food snob friends. Two thumbs WAY up. What a treat to have a birthday cake for my daughter, that is gluten and dairy free and does not taste like sawdust! Pure delicious! Evryone in my family loved this cake! More like a pound cake, but still delicious. Needed to add about 8 minutes to cook time. I made this cake and followed the recipe except I used Bob’s Red Mill 1 for 1 baking flour. I had to increase my baking time by 20 to 25 minutes. Oh I also buttered and sugared my Bundt cake pan. I’m gluten free, not vegan. The cake was perfectly delicious. I don’t know why there was such a difference in bake time, but I would suggest to others to not worry about increasing the time if needed. I don’t understand what happened. I followed recipe exactly and the batter poured out of the pan like lava and ended up a big mess. I should have read the comments before trying it. Do not try this recipe. I’m an experienced baker and do not believe this recipe is described correctly. Audrey, I’m so sorry this happened. While many have had success with this recipe, several, including you have had it epically fail. That’s so frustrating. I wanted you to know I have a couple blogger friends testing this recipe for me to help see if I’ve made an error, or what might be the problem here. My hunch is that it is variations in canned coconut milk and also a variation in bundt pan sizes. But we’ll see! I made this recipe this afternoon to test it out. I was very careful to follow the instructions exactly. I used GF Jules flour, weighed, Goya regular coconut milk and Crisco brand refined coconut oil. I used my stand mixer and what I assumed is a regular bundt cake pan (it held 10 cups of water). It tasted delicious, but it didn’t have a strong coconut flavor, probably because I used refined coconut oil instead of unrefined. I measured my coconut oil when it was already liquefied, not solid and measured it using a tablespoon at a time. The only issue I had was the baking time. My pan seems to be taller than the one used in the recipe and at 30 minutes, the batter was still very wet in the middle, it took 45 minutes for it to be done in the middle, using the toothpick test. I shared with my neighbors and everyone loved it! I do not own either a hand nor a stand mixer. I do have a food processor with a plastic blade however. Do you think that I can successfully make this with what I have. It sounds SO good. I have to say that the directions were strange but I followed it for the most part…I used coconut cream and reduced the oil to have a cup and gently folded in the flower mixture, I also reduced the temp to 300 and baked for a long time until the toothpick came out clean. It was the most delicious cake, light fluffy and a light lemon taste. I think adding lemon extract next time should do it. Thanks for a wonderful recipe, my new fav! Hello, third time making this amazing cake, everyone I feed it to loves it! I agree with some of the other comments, it definitely doesn’t cook in 35 min, takes at least 45. Could you update the recipe so I don’t forget again lol. Thanks ???? Sorry no. Feel free to try with your favorite egg-free substitution and report back on how it worked! My husband made this for our family and it was delicious! 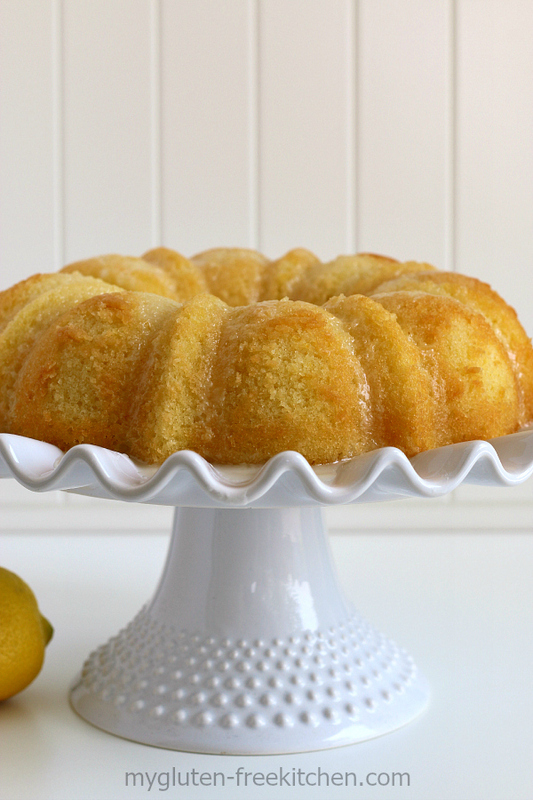 This is our go to lemon cake! We’ve tweaked it just a little based on our preferences. I only use brown rice flour. We never use xanthum gum or guar gums because we don’t tolerate them. We use 3 lemons because we love that real lemon flavor and use canned coconut milk. We also put shredded coconut in the batter. We bake as a cake in a 9×13 baking dish. We also make a lemon glaze and pour over the top. Its so delicious! This is a dense cake, but we really like it! Why can’t you use a gf all purpose flour with bean flour in it? I wish that was in the ingredients section of the recipe which I used for reference when shopping…thinking of trying it anyway. I’m only dairy free but we’re having a family party and my grandmother is gluten free so I was hoping to make something we could both enjoy. Flour blends with bean flours, in my opinion, do not provide great texture or flavor. I recommend avoiding them and choosing better blends for better results.